InstantForum provides a number of out the box features to help you protect your community against forum spam. If you experience any spam within your community we would strongly recommend you follow the guidance within this article to help reduce and hopefully eliminate spam. The extra step of creating an account ensures users must validate the email address they supply during registration which is a good first linen defense against spammers. Of course spammers can also easily create free email accounts so we would also suggest following the additional suggestions below. Probably the most effective and simple way to catch both spam registrations and spam posts is to enable the StopForumSpam.com integration we have built right into InstantForum 2014 or above. For further information please see our Enabling StopForumSpam.com Integration guide. Once you enable our StopForumSpam.com integration all posts and new registrations can be checked against the central database maintained by StopForumSpam.com of known spammers. If a post or user registration is detected as spam you can configure InstantForum to handle the user registration or post in a number of ways. You can restrict access to areas that could be abused for SPAM within InstantForum based on users reputation level within your community. For example you may wish to only allow users to send a private message to other users once they have reached a specific reputation level within your community. This can stop new users from signing up within your community and spammer other users with private messages. You can configure the reputation level a user must meet before they have access to any of these abilities from within the InstantForum Admin CP > Manage Settings > Forum Settings > Reputation Thresholds section. Email Confirmation is the default registration type used by InstantForum and we would only suggest changing this for very specific scenarios. You can check the registration type used by your installation of InstantForum from the Manage Settings > Login & Registration page. Locate the Registration Type drop down list. Ideally this should be set to "Email Confirmation". When the registration type is set to Email Confirmation an additional validation check is performed to ensure the user actually has access to the email address they supplied. Whenever a user creates a new account within your community InstantForum will send the user a unique validation link to the email address they provided during registration. The new user account will be added by default to the built in Awaiting Activation member group within InstantForum until the user clicks the unique validation link sent via email. Once the user clicks the unique validation link they will be moved by default the built in Forum Members member group. This allows you as an administrator to provided very limited permissions for users within your Awaiting Activation member group. For example you could configure the permission set associated with the Awaiting Activation member group to not allow users to post or reply within forums. This would ensure users must first validate ownership of the email address they provided during registration until they are automatically moved to the Forum Members member group and have the ability to post within your community. TIP: You can customize the member groups users are placed into when you have the Email Confirmation registration type enabled. To change member group users are placed into whilst they are awaiting activation you can change the "Default Awaiting Activation Group" setting on the Login & Registration settings page. To change the member group users are placed into once they click the unique validation link sent via email you can change the "Default Confirmed Member Group" setting against on the Login & Registration settings page. 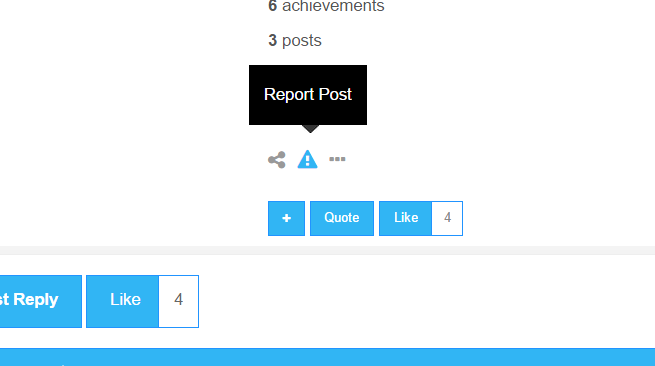 Users can earn reputation within your community each time they report a post. This is a small reward for them for helping you keep your community clean. To prevent abuse the ability to report poss can be disabled based on a user reputation level. Article has been viewed 8.2K times.